Joint Replacement India | Appt:+91-9810333738 | Best Hospital for Joint Replacement Surgery in India | Knee Replacement Surgery in India | Cost of Joint Replacement Surgery in India | Shoulder Replacement In Gurgaon India | Best Hip Replacement Surgeon and Hospital in Gurgaon India | ACL PCL Surgery India. Healthcare in India is already lower in cost as compared to other countries. Different Hospitals at different times keep coming with special offers on the costing for these surgeries. The costs may be almost 30-40 percent down during these special offers. Cost for Single Knee Replacement Surgery in India is approx USD 5500 - 7500 and Cost for Arthroscopic Surgeries is USD 3500 - 5500. Click at the Link Below to see the various offers on Joint Replacement Surgeries by different hospitals. Not all Orthopaedicians operate on all the joints. For Total Knee Replacement Surgeries the Best Specialists include Dr Ashok Rajgopal at Fortis Hospital Gurgaon, Dr Debashish Chanda at GNH Hospital Gurgaon, Dr IPS Oberoi at Artemis Hospital Gurgaon, Dr Hemant Sharma W Pratiksha Hospital Gurgaon, Dr Ashwani Maichand at Fortis Hospital Shalimar Bagh Delhi, Dr Rajeev Verma Manipal Hospital Dwarka Delhi, Dr RC Arya at Max Hospital Delhi, Dr Yash Gulati at Apollo Hospital Delhi, Dr Vikas Gupta at Max Hospital Gurgaon, Dr Sanjay Sarup at Artemis Hospital Gurgaon and Dr SKS Marya Medanta Hospital Gurgaon. For Total Shoulder Replacement Surgeries the Best Specialists include Dr Ramankant Agarwal at Fortis Hospital Gurgaon and Dr IPS Oberoi at Artemis Hospital Gurgaon. When it comes to sports injuries or Ligament injuries like ACL, PCL and Meniscal Tear Dr Praveen Tittal at Rockland Hospital Dwarka Delhi, Dr R C Arya at Max Hospital Delhi and Dr Debashish Chanda at GNH Hospital Gurgaon are considered one of the best in India. Hospitals in North India which specialize in Joint Replacement Surgeries include some of the most prominent hospitals like GNH Hospital at Gurgaon, Max Hospital in New Delhi, Manipal Hospital in Dwarka New Delhi, Medanta Medicity at Gurgaon, Artemis Health Institute at Gurgaon, Fortis Hospital at Gurgaon. Gurgaon is the Medical Hub in India because of its close proximity to the New Delhi International Airport and also because of the availability of some of the finest doctors across all specialties. A total knee replacement (TKR) is a surgical procedure whereby the diseased knee joint is replaced with artificial material. During a total knee replacement, the end of the femur bone is removed and replaced with a metal shell and the end of the lower leg bone (tibia) is also removed and replaced with a plastic piece with a metal stem. Our team of surgeons prefer to use US FDA approved implants from Zimmer, Stryker, Smith & Nephew and J&J. A total hip replacement (THR) surgery is a very common joint replacement surgery done in India whereby the diseased cartilage and bone of the hip joint is surgically replaced with artificial materials caled implant which is geerally US FDA approved. 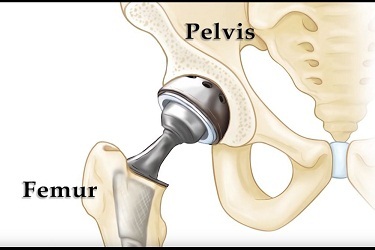 Total hip joint replacement involves surgical removal of the diseased ball and socket and replacing them with a metal ball and stem inserted into the femur bone and an artificial plastic cup socket. In knee arthroscopy surgeries most common surgeries that are performed in India are ACL repair, Meniscus Repair, PCL repair and reconstruction. In case of hip, labral tear repair is one of the most advanced arthroscopic surgery that is perfformed in India. In case of shoulder and elbow the most common problem for which the arthroscopy is performed is tennis elbow and rotator cuff injury.The cost of ACL/PCL Repair by arthroscopic method in India is 4000 - 6000 USD. Cost for repairing ACL/PCL in a single deluxe room at GNH Hospital, Gurgaon is 4000 USD. Cost for Shoulder and Hip arthroscopies are approx 4500 - 5000 USD. Rehabtrain - Advanced Physiotherapy And Rehabilitation Centre at Gurgaon is known all over the world because of the quality of its physiotherapists. Our specialists led by Dr Yash Fauzdar and Dr Jyoti Arya are experienced in diagnosing most of the problems and implementing the rehabilitation programme for quicker recovery. The team includes Dr. Rajesh Pal having more than 20 years of experience in the field of physical therapy, Dr Garima Chaudhary, Dr Archana Singh and Dr Divya Kapoor. For post surgeries patients our team provides home care facility within Delhi NCR.